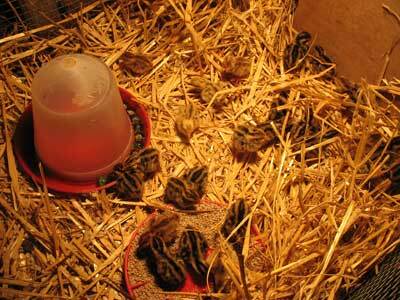 At Monday tea-time the quail chicks were moved from the incubator to the brooder. There are 29 quail chicks in the brooder and some are dark brown a few are a fawn colouring and one or two are creamy coloured. The chicks are very lively and quickly found the chick crumbs and started eating them, which they seem to enjoy. They are happy moving about the brooder on the straw and there are no signs of splayed legs.